I am extremely fascinated by old towns and villages – the cobblestone streets, the traditional houses, the old architecture and the simple way of living. I am so into old villages that I think I was born in the wrong century as I would definitely love to live in these kinds of places with my horse-drawn carriage and big ball dresses. 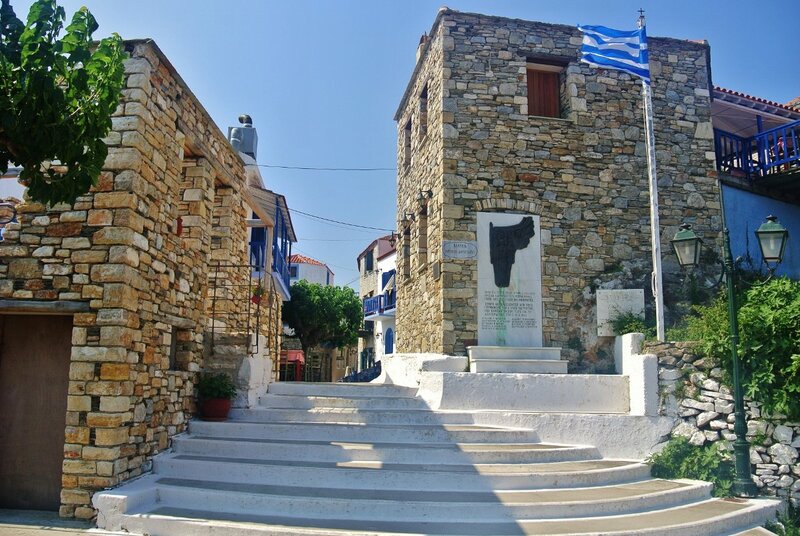 As luck would have it, I can only visit old traditional villages now and hope that they were able to keep the original and authentic feel to it – such is the case for the Old Chora of Alonissos. As I walked into the cobblestone path of the Old Chora of Alonissos which opens into a square beside the old church, it gave me a feeling that I have been transported back in time. It was 10 in the morning, the restaurants and tavernas have not started their business yet so we were practically by ourselves exploring the small alleys of this unique and very charming old town. While The Greek Mister had his Greek frappe, I together with my sister-in-law wandered the steep, white-washed cobbled streets of Chora with its many lovely residential houses, tavernas, bars and small charming shops. At some point, we got separated as we were both too busy taking photos of every single thing that we lay our eyes on. I definitely wouldn’t mind getting lost in Old Chora. In fact, I think this is the most I’ve walked during this holiday as the alleys in this old town seem to call you to walk on them. The alleys seem to be never ending. I have walked down numerous steep steps and walked right back up some more of them but I feel like I have not even scratched the surface of this old town. The inevitable happened at some point, I got tired. I sat down at one of the chairs of a taverna which was yet to open for the day. I sat there for quite awhile, just admiring the simplicity of Old Chora. It’s funny because more than the architecture and the traditional feel to all of it, it’s the simple things added to it which makes it more exquisite to me. The flowers on the balconies, the sleepy cats and the humming of the birds just to name a few add an aesthetic touch to the village which brings out a more wonderful ambiance and non-pretentious elegance to it. I can live there, seriously. I think Old Chora of Alonissos is the most beautiful Greek old town that I’ve seen. It’s absolutely mesmerizing and would be hard for one not to fall in love with it. I later found out that Old Chora’s residents are 60% foreigner (mostly Germans and British) and only 40% Greeks. The foreigners have discovered this place and fell in love with it instantly that they immediately bought their second home here. When I grow up or whenever I have saved enough money (whichever comes first), I just might do the same. WOW, this place is stunning!! As you, I also love old towns. Greece rocks, I can’t wait to go there someday! I can see why foreigners fall in love with it! It is exactly what I imagine when I think of old Greek towns. So picturesque. Beautiful! I’ve only been to one Greek place (the island of Samos) and so the white with the purple flowers remind me of that day. I can definitely see why people would want to live there!! Beautiful photos. Like you, I love the cobblestone streets, old houses and creeping vines. Stunning photography. I’ve never had a desire to visit Greece, but lately I’ve seen so many gorgeous photos that I am reconsidering! The Wild Allure of Kokkinokastro Beach, Alonissos, Greece.